This post has been in the works for quote some time. In fact it started with a conversation with my good friend Michelle Cordy in China on a high speed train. We were joking about a tweet on downloading youtube clips on chrome and I tweeted that I found this on google. This was then replied with: did you just let me Google that. My reply was yes. This is a conversation that we are having more and more as the power of technology grows. Our students have in their hands a whole universe of knowledge and this is just what they are doing. Can you blame them? However, just googling it is so much more and this was were Michelle ‘ s and I conversation went. When I google I don’t just let the first response dictate the information I use, I don’t just keyword something and believe the information, I curate. curate something (especially on the Internet) to collect, select and present information or items such as pictures, video, music, etc. for people to use or enjoy, using your professional or expert knowledge. When I search for information for friends or myself I use Google but I collect and select carefully. It isn’t just any information that I use but ones that I feel are important for my research. So how does this relate to today’s classroom. Lately I have heard a lot of fear that we are raising a society that jusy google and that is not good enough. My fear isn’t that I am raising kids who google but that we are raisin kids to memorize and not critically think about the facts they consume. Information isn’t like it was when we were kids, even when our parents were kids. Information is rapidly changing. In my lifetime I have used encyclopedias (book form), to digital Cds, to having it at my finger tips. Information changes so quickly that we have new phones every Six months. The information we are giving our kids will not serve them when they head into the work force. What will is being able to critically think and search for that information. So I am fine that my students are googling, in fact they should be because my assessment and learning doesn’t depend on the facts they find but how they use those facts. Googling is a tool that our kids should learn how to use. They should be curators of data and learn how to search, find, and use the data that is at their finger tips. What do you think? Love to hear your thoughts. I often wonder why I do the things I do? I know it is a question that many of us teachers ask ourselves. We are often in isolation and we often never get to see the same kids twice in a row. Well today was a validation moment. One of our teachers came told me today that he had was having a discussion with one of my former students about multiplication. This was in a grade 4 classroom and I taught the student in grade 2 when she was starting to learn multiplication. I have always tried my best to show the mathematics in everything that we teach. I know that many students may not get it right then and there but I expose them to language and big ideas as much as possible. For me it will allow students to understand later on as they develop the skills. Now as I said before I have always wondered if what I do is correct but when I see that my students retain and then prove their thinking based on what I taught two years later, it does make me feel good, as well as, validate how I teach and why. This is just one small moment this fall. In fact it was quite hard to think of the BEST learning has this year has been a whirlwind of learning but thought this was just one of those stories that make you smile. Are we reluctant to share? Are we scared to share? Do we often feel like what we have to say isn’t worth reading? I know that I do. But we have to remember that what may seem as silly to us is often not for others. I say reluctantly because I wasn’t too sure about the topic. I mean I loved the idea, it is why I decided to write but I wasn’t too sure if anyone else would have cared, or even wanted to read it. It was more of a reflection or response to the comments I was hearing about our profession of teachers. However, I decided to post and the next day a good colleague David Petro posted my blog on his daily Math Reviews (on a side note if you are not following David or reading his weekly blog you are missing out). The funny thing was my post wasn’t even about math but on what it means to be a teacher. It did comment on teaching being more than telling, which I often think this is the preconceived notion of a teacher and why many think they can do our job but I digress. The fact was that David saw something in my post and then felt the need to share it. Even though I didn’t think that the ideas were decent someone else did. To be honest I think that as a profession of teachers we all have amazing ideas and need to share them. We only get better by reflecting and learning from one another. So if you ever feel like your ideas don’t matter remember that an idea that may seem trivial to you, may not be for someone else. If you don’t share that knowledge or thought than you are depriving the profession of some amazing ideas. So I encourage you all as teachers, readers, parents get out and blog, Share your amazing ideas and connect with amazing people. And a big thank you to David for reminding me about this. Author MrSoClassroomPosted on November 17, 2015 Categories best practises., http://schemas.google.com/blogger/2008/kind#post, Math, random acts, teacher thoughtsLeave a comment on Are we reluctant to share? This year I started a new grade and even a new division, grade 6. On top of this I have decided to do a lot of things differently. 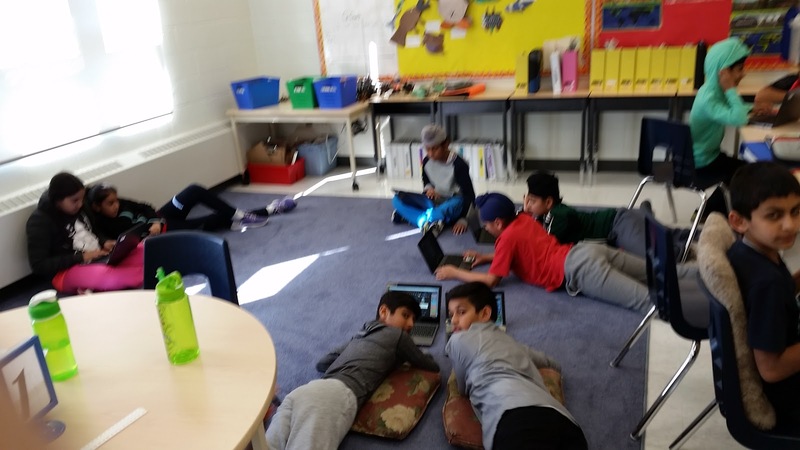 I have thrown out grades completely, I have no desks, I have gone 95% digital with my classroom, collaborative problem solving and I wanted to turn my grade 6 middle school classroom into a place of inquiry and learning. As the year has progressed I have gained more and more confidence in my decisions. I am close to my 200 limit here but let me briefly share with you what those decisions have looked like. In the past I have done this for the most part but this year I have not given one grade to a child. Instead, I have written monthly reports or updates about students strengths and weaknesses. Students have then written down what they think their strengths and weaknesses are and next steps for improvement. This goes home to parents (well actual in their drive). Students are more engaged, they ask questions not about marks but what they can do better. I have students who are now conferencing with me without my prompts. It has been great. 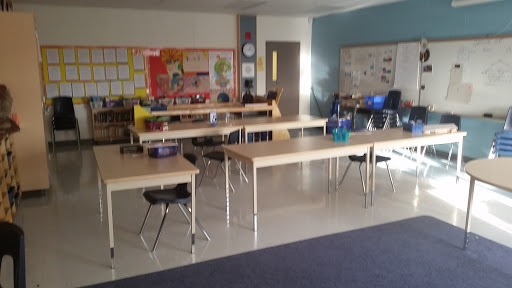 As part of making my space inquiry driven and “play-based” I have no desks, just work stations. Kids choose where they want to sit. The carpet, desks, under desk, wherever they feel comfortable to work. This has given me more freedom to worry about the learning. Kids have also become more independent as they have learned to move where they will be getting work accomplished not just with their friends. I honestly keep forgetting the photocopy code. But having google drive it has allowed me to open the classroom walls and share every file with my students. They want a note or homework taken up its there. Want to share a video with parents, its there. No more paper, no more mess all online. I have been blogging about this for quite some time and I am in no way an expert but this has single handily been the best thing that I have done this year. For those that are unfamiliar with CPS, it is basically working together to get our difficult kids to not be difficult. I started it because my daughter is one of those difficult kids. It is not because she wants to be or because we have really bad parenting but because she doesn’t know how and needs help to learn it. This year I have done it with certain kids and the whole class and I really don’t have problems in the classroom. I don’t have to be the mean, strict, yelling teacher but one that can talk to my kids and work through a solution. Just a fair warning CPS like any method is not a immediate fix. It will take time but it is time well worth it. Some may think this isn’t possible but again another great moment. My kids are driven to work on projects because they care. I have gotten some of the best writing and learning from them all because of inquiry and allowing them to invest in a big idea versus checking off curriculum. The funny part, all curriculum is done. Now if you have been reading my blog I absolutely love inquiry but I have often heard that it is hard to do in middle school. I would like to challenge that notion as it has been amazing. What has been some of your best things that you have done this year? Can we truly have a student led lesson? My students hard at work on a class project. Focus: Why do people Come to Canada? I have heard these terms (student led and Student choice) being used and it has started to make me do some thinking. My biggest problem that I am having is if we as teachers are making detailed and thoughtful lessons, can we truly have student led lessons? Now I know I may be questioning or going with the flow but, hear me out. I understand that as teachers we need to have the voice and ideas of the students at heart of our lessons. Teaching is no longer about the wise old sage on the stage giving all of their knowledge to their students. but should be more about facilitating the learning that is happening. If that is what you mean by student led then I am all for that. However, let me push some thinking more here. In the last three years I have been highly influenced by Stein et al. article titled: Orchestrating Productive Mathematical Discussions: Five practices for helping teachers move beyond show and tell. In this article they showcase five practises that all teachers should be doing. The first thing is for the teacher to look and see how students might mathematically solve these types of problems. In addition, teachers should also solve them for themselves. Anticipating students’ work involves not only what students may do, but what they may not do. Teachers must be prepared for incorrect responses as well. While the students are working, it is the responsibility of the teacher to pay close attention to the mathematical thinking that is happening in the classroom. The goal of monitoring is to identify the mathematical potential of particular strategies and figure out what big ideas are happening in the classroom. As the teacher is monitoring the students work, they are also selecting who is to present based on the observations that are unfolding in the classroom. Having monitored the students, it is now the role of the teacher to pick strategies that will benefit the class as a whole. This process is not any different than what most teachers do; however, the emphasis is not on the sharing, but on what the mathematics is that is happening in the strategies that were chosen. With the students chosen, it is now up to the teacher to pick the sequence in which the students will present. What big ideas are unfolding, and how can you sequence them for all to understand? This sequencing can happen in a couple of ways: 1) most common strategy, 2) stage 1 of a big idea towards a more complex version or 3) contrasting ideas and strategies. As the students share their strategies, it is the role of the teacher to question and help them draw connections between the mathematical processes and ideas that are reflected in those strategies. Stein et. al. suggest that teachers can help students make judgments about the consequences of different approaches. They can also help students see how the strategies are the same even if they are represented differently. Overall, it is the role of the teacher to bridge the gap between presentations so that students do not see them as separate strategies, but rather as working towards a common understanding or goal of the teacher. If we follow these practise as teachers we are thinking about good contexts that will create huge discussion in our classrooms. We are anticipating results and answers so that we as teachers can ask the right questions at the right time. We are planning and sequencing work so that the end results end up close to the Big Ideas that we were hoping to accomplish and we as teachers are prodding, questioning and revoicing so that the Big ideas are brought to the students attention. Finally, we then create similar problems so that students have the opportunities to try these ideas out again. Now I know that this article is a math article but these practises can be and should be for all subjects. So if we follow this line of thinking, who is really leading the lessons? Is it the students? or is it the teacher? If we as teachers are putting in this much thinking and planning do we truly have student led or based lessons? or is it because we have put all of this planning into our lessons that students feel that the lesson is student based and that is really all that matters? 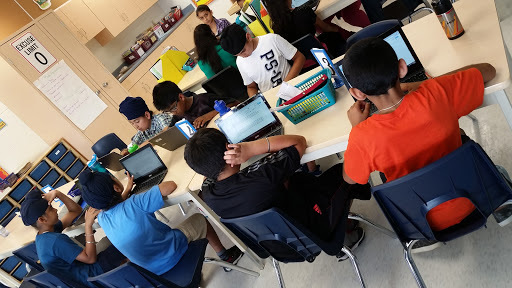 Author MrSoClassroomPosted on November 3, 2015 May 7, 2016 Categories #MakeSchoolDifferent; reform, #sharesease, Accountable talk, assessment, best practises., Classroom TeachingLeave a comment on Can we truly have a student led lesson? I have started a new grade this year and moved up to six. Its been a lot of fun. The social studies curriculum in six has the students learning two things: 1) Global Issues and how Canada and other countries deal with them and 2) The Canadian Identity and the various parts that have made it up. My teaching partner and I felt that Global Issues might be to big of a topic to start with as many of our students don’t really know what happens beyond their neighbourhood. However, we decided to start broad, then go closer to home and eventually go back out to the world. We felt that the students needed to understand various problems that are out in the world to than see how the world has impacted us as Canadians. To do this we developed a Global Awareness project. The students had to pick a global issue in the world and research. They had to figure out what the issue was and why we should care about it. I knew that being August (we are a balance calendar and teach in August) my students wouldn’t have a lot of research back ground so we also turned it into a unit to learn how to research and write smaller reports. The focus of the centers was on asking critical questions, taking jot notes and writing paragraphs. Students also had to create short movie trailers for their global issues. Once this was done students wrote a mini report about their global issue. Here is their writing: https://drive.google.com/open?id=0B_euA7pkOAyXeERZTnMyNjd3ZU0. It has been amazing because I was able to team up with Peter Cameron from Thunder Bay and Barb VanHatten from Lakehead University. Together the two of them have been giving feedback through the ConnectED project that Peter started. My students have loved the impact that their writing has done and they have loved the real feedback, instead of just my thoughts to them. We plan to revisit these global issues again at the end of November and revise the learning that has happened from their other units. Please remember that these projects where their first attempts at writing longer report writing pieces and making videos. Just thought I would share this project and if you have any thoughts or feedback for my students please message away, they would love it.